If you've ever noticed a small map and links with red markers above the normal Google results, then you know what local search looks like. If you're searching for local products or services, the local listings look pretty inviting, right? 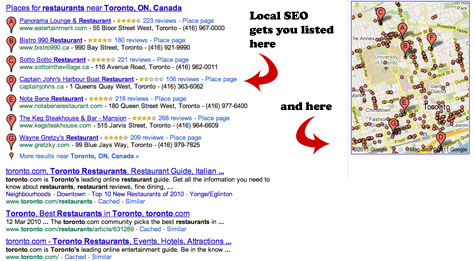 A lot of other search engine users think so too, so you probably understand why we feel local SEO is essential. Don't miss out on customers trying to find you because your listing isn't high enough in the rankings! By focusing on local search activity instead of a broader spectrum of online searches, you are targeting a local market ready to buy your products or services. Many consumers today are conscious of buying local and it is important for small to medium-sized businesses to target those sales. The popularity of local search is growing and can be seen by the increased integration of maps and local business listings in search engine results. Where there used to only be the organic top 10 web sites in SERPs (search engine result pages), we now see social media, news stories, video, and local listings showing up. 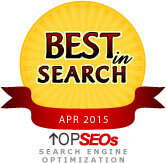 It is no longer sufficient to carry out search engine optimization in the same manner as we did years ago. Online search is always evolving and here at FreshPromo we're dedicated to staying on the cutting edge of all things SEO. Tap in to your local community and make a name for yourself. Contact FreshPromo today and we'll be happy to give you a personalized quote and consultation free of charge. Before hiring a search engine optimization company, site owners should know a few things about their web site and competition. Although FreshPromo offers search engine optimization services, we also offer this detailed analysis, free of charge and with no obligations, to anyone thinking of hiring an SEO firm. Our reviews are done by SEO experts and include suggestions and observations unique to your web site and Canadian market.